I’ve been doing a little ground work the last week or so for my participation in Fahrenbruary, but here on the first day of it, I find myself a little short of anything to say. But I couldn’t let the month kick-off without something, and it’s still technically the 1st of the month here, so I’m good. Honestly, The Beardy Book Blogger’s kickoff post is where to start — especially if you have no idea what I’m talking about. 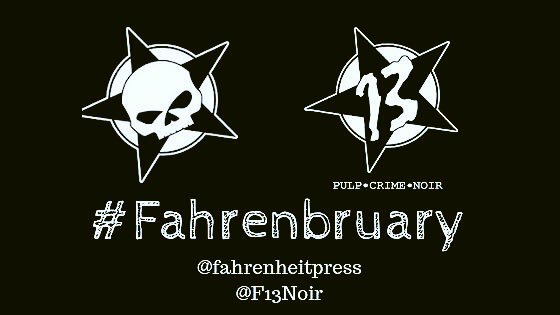 But to summarize, Fahrenbruary is a month-long celebration of the publishers, Fahrenheit Press and Fahrenheit 13; their authors and their books. I haven’t worked out my schedule or anything precisely (hopefully tomorrow) — but essentially, over the next month I’ll be reading my backlog of Fahrenheit books, posting about them, reposting things I’ve said about other books, and I’ve got some other nifty things in the pipeline. I’m looking forward to seeing what teh IntraWebs comes up with to commemorate the month (it seems that the good people over at Fahrenheit Press are compiling an index). I really wanted to get something new written for today, but that just didn’t happen. So instead, coming right up is the first thing I ever said about Fahrenheit Press — back in 2018. Come back next week for something fresh and hot. Since you’re devoting a whole month to them, it seems Fahrenheit Press reeks of awesomeness. Can you clue me in as to why that’s the case? This is an excellent question — one I should’ve addressed in my post (ahh, to have been organized…). A lot of indie publishers are around that put out good stuff (a lot put out stuff I can’t believe, but that’s beside the point). But not only do the folks at FP/F13 go for excellent, they go for excellent with a twist, or an edge. There’s a certain aesthetic to all their titles. While the style/setting/type of protagonist will vary, they somehow all feel similar. You don’t often read a book and say “that feels like a Random House book,” for example. But you will with Fahrenheit’s stuff. I don’t know that I could say that of other indie publishers — including ones I like. I’ve actually done thought experiments about “I wonder if this book could’ve been picked up by Fahrenheit” — and there’ve been excellent books (or even pretty good books) that I know wouldn’t have been picked up by Fahrenheit, and others that would’ve fit in there. Also, there’s this strange “we’re all in it together” vibe amongst their authors. I’ve never seen any group of people who share a publisher pimp each other’s books the way these authors do. Many of the authors — and the publisher themselves — have compared them to an old punk label. I think it’s fitting. Check in over the month, and you’ll see at least 5 of their authors sound off on the idea here. They’ll probably do better than I managed to do off the cuff. I’m a fan of punk music – NOFX, Bad Religion, etc. etc. – though not as much as in my youth. In my rebellious teenage years, slapping in “Full Circle” by Pennywise and zooming away in my decrepit 1992 Chevy Lumina was the height of awesomeness. If this publishing press has that punkish edge, I’d be interested in their stuff. Though (and here I already contradict myself) punk does have its excesses. There’s a big distinction between endless rage and quality, nuanced stories or music.